Crystal mercurous chloride powder sublimed from mercury, alum (or chalcanthitum) and salt. Mainly in Hubei, Hunan and Shanxi provinces of China. Without bad smell, light taste, gradually become dark colour in light. Large pieces, light weight, white with luster and slightly shattered. Protected from light, ground into fine powder. Pungent, cold; toxic; large intestine and small intestine meridians entered. Counteract toxic pathogen and kill parasites and relieve itching, astringe dampness and heal wound for external application, expel retained water and relaxing the bowels for internal application. This herb has strong actions of counteracting toxic pathogen and killing parasites to relieve itching, astringing dampness and healing wound, so it is especially good at treating pruritus diseases and wet inflammatory dermatosis with discharge for external application. For ulceration of sores and ulcers, it is often combined with blood-activating and tissue-regeneration-promoting herbs to obtain the actions of activating blood, removing putridity, healing wound and promoting tissue regeneration. For instance, it is combined with Dang Gui, Xue Jie and Zi Cao, etc. in Sheng Ji Yu Hong Gao from Wai Ke Zheng Zong. For impetigo, itching of eczema, it is often combined with other dampness-astringing herbs to reinforce the actions of astringing dampness and healing wound and relieving itching. For tinea due to dampness, scabies, it is often combined with parasites-killing and ringworm-curing herbs to obtain the action of killing parasites, curing ringworm and relieving itching. This herb can relax the bowels and expel retained water to alleviate edema for internal application. For excess syndrome of edema and constipation, it's usually combined with drastic hydragogues to reinforce the action of expelling retained water to alleviate edema. For example, it is combined with Da Huang, Gan Sui and Jing Da Ji, etc. in Zhou Che Wan from Dan Xi Xin Fa. Take proper dose for external application. Ground into powder for mixing and spreading or used powder directly. It can be made into plaster for external application. 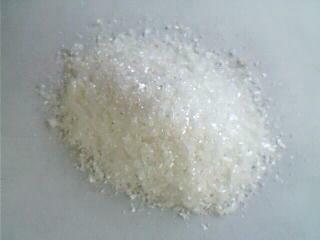 Take 0.1~0.2 g per time for internal application in pills or powder. Being toxic (It can induce hydrargyrism), it should be used with cautions for internal application, and gargled after administration. It is contraindicated for weak people and pregnant women. For external application, it should never be overdosed or for persistent use.